Remember when you used to brave hours of traffic or I-can't-even-see-where-this-thing-ends airport security lines to make it home for a turkey dinner with the family? Yeah, we're kind of over that too. If you're sticking around for Thanksgiving this year (and LA seems like a pretty good place to be at the moment for lots of reasons), here are tons of great ideas of what to do -- from big restaurant dinners and turkey takeouts to volunteer opps and turkey trots. You can do the more traditional roasted organic turkey with gravy thing here or get the lobster entrée with truffle butter because, ya know, you're eating at a Beverly Hills hotel on Thanksgiving night (take that, hometown peeps on Facebook). The dinner comes with six sides for the table and because it's José Andrés' place they're all pretty interesting (roasted carrots with smoked yogurt and z'atar and mashed sweet potatoes with passion fruit marshmallows, for example) followed by a sure-to-be-delish dessert. Here's where you get to call your friends in New York and tell them you're having Thanksgiving dinner on the beach. In Malibu. 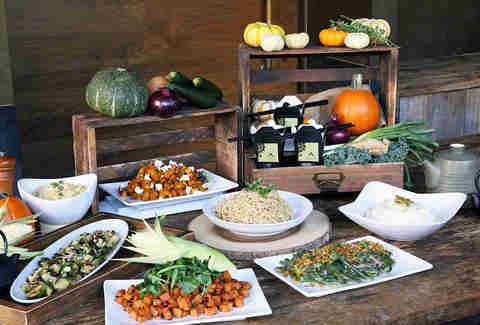 After a butternut squash soup amuse bouche, first course choices include a fall harvest salad with figs and persimmons and entrees include citrus and cider-braised free-range turkey with traditional fixings, or a pork chop with sambal Brussels sprouts, and maple-roasted sweet potatoes. You'll get pumpkin pie or a caramel chocolate fudge torte for dessert before taking a selfie in front of the ocean. At the stylish restaurant inside Ace Hotel Downtown, go with the prix fixe of root vegetable panzanella, a turkey terrine with sides, and sweet potato pie or order any of them a la carte along with anything from the regular menu (yep, you can actually just get a burger with no judgment). The Thanksgiving dinner lineup at Brooke Williamson's normally seafood-focused spot screams good deal. You can sit down to a turkey or honey-mustard crusted ham meal along with salad, roasted acorn squash, sausage, and chestnut stuffing, cranberry sauce, green beans, maple yams with those little marshmallows, and pumpkin pie. There'll be a few regular old dishes available too. If France is on your list of countries you may be relocating to, then you can pretend you're in Paris at this Thomas Keller bistro (while also pretending they serve Thanksgiving dinner in France). He's got a foie-and-chicken liver mousse starter on the menu, and his classic steak frites entrée along with turkey with stuffing, gravy and sides, and multiple pie options. You can also do a wine pairing for $90 and there will be Bouchon's usual raw bar and seafood tower options available along with caviar service in case you're feeling fancy. The fabled gay bar will be doing lobster bisque, a hickory-smoked turkey breast with an array sides like truffled mashed potatoes and brioche stuffing and a choice of pie for this bargain price as well as offering wine and Champagne pairings. The extensive regular menu (and all those martinis) will also be there for the taking. The Patina Group's pretty new brunch spot at Descanso Gardens will kick off a six-week dinner service during the holiday season starting with a special prix fixe on Thanksgiving evening. You can start with a pumpkin and coconut milk soup or a winter squash salad and follow it up with either a turkey entrée with all the fixings or mix things up with osso buco with creamy polenta. Dessert offerings include pumpkin pie (duh) or the really-good-sounding chocolate pretzel bread pudding. Brian Malarkey's slick hotspot at the Mondrian will offer a multi-course, family-style supper for Thanksgiving, which should pair well with the sweeping views of LA that you can check out from the patio or dining room. You’ll find some classic dishes like the roasted turkey breast and garlic mash, as well as welcome twists like marinated pork loin and oyster stuffing. 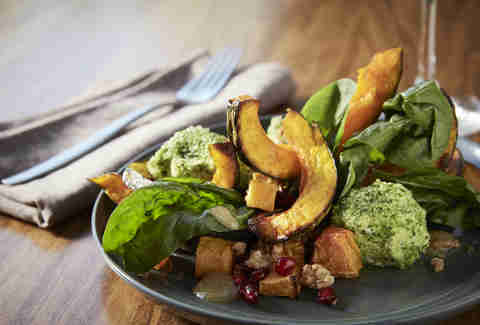 They’ll also have a lineup of salads and other sides, plus desserts like an apple tartlet and butterscotch pudding. 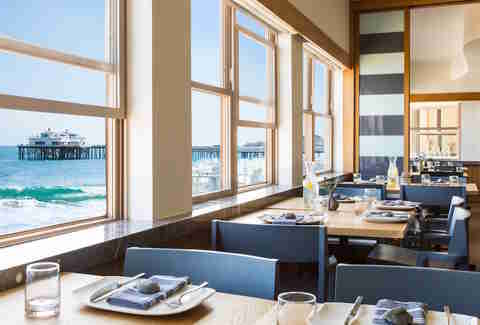 Head to Shutters on the Beach for a Turkey Day dinner with an ocean view. The line-up includes butternut squash soup served with Maryland blue crab cake; free range Turkey paired with sweet potato mash, cranberries, Brussels sprouts and smoked bacon stuffing; and a slice of pecan pie topped with salted caramel and bourbon whipped cream. Post-dinner jump in the ocean: optional. You can get a 14lb organic free-range turkey (this is Venice, after all) that's been brined and maple-glazed, giblet gravy, turkey jus, three sides (a Yukon Gold potato puree, sea salt roasted tri color carrots, carrot top pesto green bean salad), and parker house rolls included when you order the whole shebang from this Jason Neroni joint. Throw a pie in for another $25. We all know that the abundance of sides are the best part of Thanksgiving dinner anyway, correct? So whether or not you're planning on tackling a turkey, you can order one or all of these six high-calorie dishes, including truffle mashed potatoes, Brussels with bacon, creamed spinach, and goat cheese baklava (just like mom never made) -- from either of this swanky steakhouse's two locations. You're looking at 15lb butter-roasted fresh free-range turkey (and we dare you to find a non-free-ranger on a menu in Los Angeles County), gravy green bean casserole, Yukon Gold potato puree, brioche-sausage stuffing, sage-roasted yams, and Hawaiian-style sweet rolls with the honey pine nut butter. 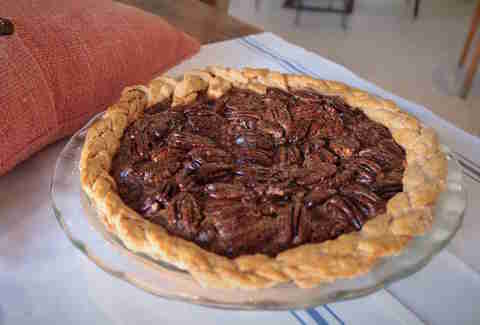 Plus, they’ll have desserts like a roasted pecan pie, pumpkin pie, and ice cream by the quart. If you're over turkey this year, you can swap it out for a sea salt-roasted prime rib for an extra $50. The deal: Herb-brined whole turkey that feeds 10-12 people for $119; or herb-brined turkey breast that feeds 4-6 people at $49. Plus tons of sides. 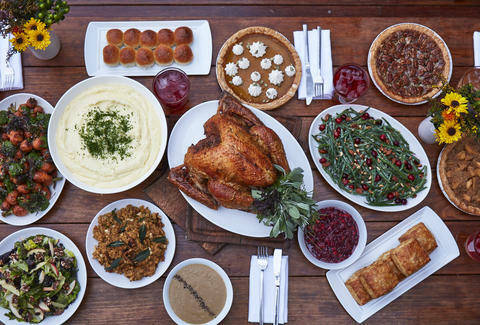 Head to this Santa Monica favorite for classic Turkey Day options with an Asian twist. You can grab an herb-brined whole turkey or turkey breast, both with house gravy, depending on the size of your crew. Then for stuffing, you can opt for the turkey apple sausage variety or Mama’s Sticky Rice Stuffing with shiitake mushroom, Chinese sausage, and chestnuts, both available by the half or full pan. Sides include An's Famous Secret Kitchen Garlic Noodles (the only time of year they’re available for take-out), smashed yams, roasted potato and cauliflower gratin, plus a five spice pumpkin pie for dessert. 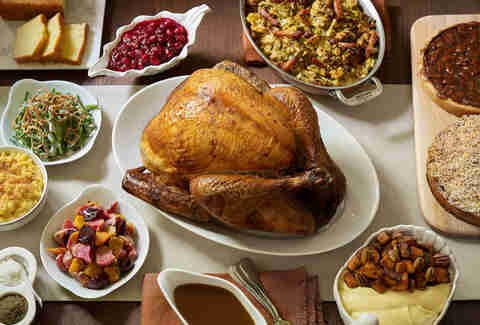 The deal: Whole, wood-smoked turkeys, plus a la carte sides; feeds 8-10 or 12-16 people at varying prices. While you may be tempted to swap BBQ brisket or ribs for turkey at this Culver smokehouse, they’ll also be offering whole wood-smoked turkeys for the holiday -- which is way safer than trying to fry the bird yourself at home. The turkeys are available in three different sizes, ranging from 12-19lbs, priced at $217, $252, and $276 each. So not the cheapest flock in town, but a top-notch option for a splurge. You’ll also find sides like cornbread sausage stuffing, braised greens, and buttermilk biscuits with honey butter, plus chocolate bread pudding. All turkeys must be pre-ordered by calling (310-313-6328) by 4pm on Wednesday, November 16th. This dinner, which has been going on for more 30 years, feeds thousands on Thanksgiving Day and can use lots of help both at the dinner, taking place Thursday and leading up to it. On Wednesday, you can show up anytime between 3pm and 8pm to help with the setup and if you want to help out during the actual event, call ahead to sign up for a shift. Oh, and if you're cooking a turkey or baking a pumpkin pie, consider making an extra to contribute. 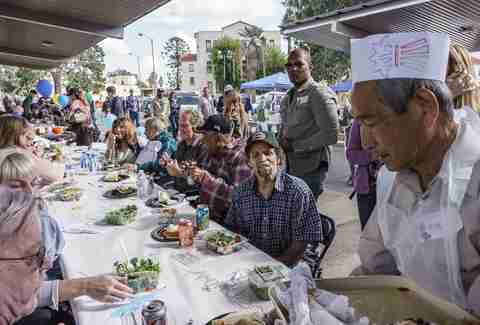 What started as a group of friends who first teamed up 18 years to feed homeless citizens in their Echo Park neighborhood on Thanksgiving morning has now expanded to include cities around the country, including multiple LA-based operations. There are tons of ways to help prior to and on Thanksgiving as the group is looking for everything from drivers to people who have an oven (and you're most likely one of those) who can warm a turkey. You can also drop off cooked dishes (sides, turkeys, and desserts), toiletry kits, and clothing and blankets on Thanksgiving morn. 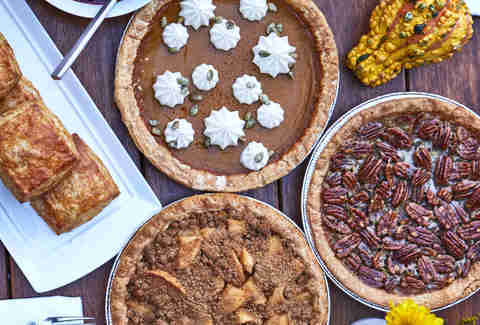 This outdoor dinner that serves thousands every year is all set on volunteers but they're still looking for store-bought pies (home-baked ones aren't allowed due to health regulations), that you can drop off Thanksgiving morning. Before that, the organizers will be in need of a host of canned and packaged goods that they'll use to make the big meal, which you can bring by anytime between now and November 19th. 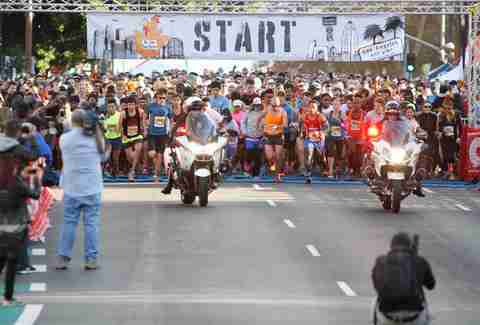 You can take on a 5K or go the extra mile (or 3.1 miles, actually) and do the 10K. Both start at City Hall and loop around landmarks like Disney Hall and The Hellman Building. Also, every participant gets a turkey trot trucker hat. It may be worth heading down to the OC for the biggest trot around. (C'mon, they even own the website turkeytrot.com, that's how big a deal it is). There's both a 5K and a 10K that give runners some pretty perfect coastline views, a costume contest, and a health and wellness expo so you can get one more dose of don't-overdo-it guilt before heading home to eat the equivalent of eight dinners. Between stuffing your face, running a short distance and/or volunteering, it's been a long day. Wind Turkey Day down with a drinks at one (or more) of the many bars that stay open on the holiday. North Hollywood tiki shrine Tonga Hut will be mixing Mai Tais and will run happy hour specials from 8pm-close ($3 well drinks, $2 PBRs and Miller Lites, and $5 drafts); you can catch a live jazz-funk band in the lobby of the Culver Hotel in Culver City; get cocktails on the roof of Ace Hotel Downtown at Upstairs; or go the beer-and-football route at 33 Taps in Silver Lake. Lizbeth Scordo is a food and lifestyle writer who plans to eat more than fourteen different side dishes this Thanksgiving. Follow her on Twitter @lalizbeth and on Instagram @modlizbeth.